Yahoo! News is reporting that Universal Pictures is planning on rereleasing the New Age film and box office dud Peaceful Warrior in theaters on March 30. The only difference is that this time admission will be free. Universal is offering $15 million worth of free tickets to the film through Best Buy in a grassroots marketing ploy to try to get word out on the film, not unlike a similar strategy used on the Christian film Left Behind back in 2000 (although it went directly to video then hit theaters). This is certainly an interesting move, but I doubt it will be a profitable one. Handing out free tickets to a film with pretty much zero interest outside of very small niche markets is not going to encourage those who really want to see it to pay money for it. This is not the kind of film that plays well across the board. I doubt it will expand interest beyond fans of the best-selling inspirational New Age book on which it is based. 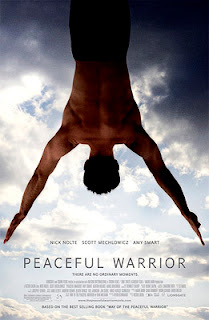 Peaceful Warrior made $1,066,748 during its initial theatrical run back in June 2006, according to Box Office Mojo. And they're giving away $15 million in tickets? There's no way this movie will turn a profit.